Parasomnias are defined as undesirable physical phenomena accompanying sleep that involve skeletal muscle activity and/ or autonomic nervous system changes. (1) Parasomnias can be objectively diagnosed by means of polysomnography (i.e. the physiological monitoring of sleep), and can be successfully treated in the majority of cases. 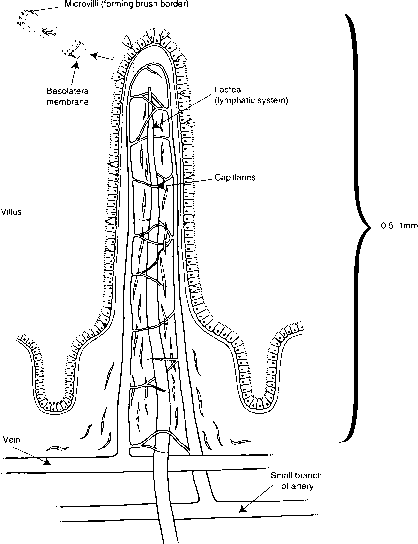 (23 and 4) Understanding of the parasomnias, based on polysomnographic documentation, has expanded greatly over recent years, as new disorders have been identified, and as known disorders have been recognized to occur more frequently, across a broader age group, and with more serious consequences than previously understood. (23,4,5 and 6) There are at least eight reasons why parasomnias should be of interest to psychiatrists. 1. Parasomnias can be misdiagnosed and inappropriately treated as a psychiatriXc disorder. 2. Parasomnias can be a direct manifestation of a psychiatric disorder, e.g. dissociative disorder. 3. The emergence and/or recurrence of a parasomnia can be triggered by stress. 4. Psychotropic medications can induce the initial emergence of a parasomnia, or aggravate a pre-existing parasomnia. 5. Parasomnias can cause psychological distress or can induce or reactivate a psychiatric disorder in the patient or bed partner on account of repeated loss of self-control during sleep and sleep-related injuries. 6. Familiarity with the parasomnias will allow psychiatrists to be more fully aware of the various medical and neurological disorders that can be associated with disturbed (sleep-related) behaviour and disturbed dreaming. 7. Parasomnias present a special opportunity for interlinking animal basic science research (including parasomnia animal models) with human (sleep) behavioural disorders. 1. Clinical sleep-wake interview, with review of medical records, and review of a patient questionnaire that covers sleep-wake, medical, psychiatric, and alcohol/chemical use and abuse history, review of systems, family history, and past or current physical, sexual, and emotional abuse. 2. Psychiatric and neurological interviews and examinations, including psychometric testing. 3. Extensive overnight polysomnographic monitoring at a hospital sleep laboratory, with continuous audiovisual recording. Figure...!, and Fi.gure .2 show the polysomnography montage: electro-oculogram, EEG, chin and four-limb electromyograms, ECG, and nasal-oral airflow (with full respiratory monitoring whenever indicated). 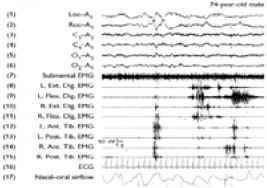 Polysomnographic paper speeds of 15 to 30 mm/s are employed in order to detect epileptiform activity. Urine toxicology screening is performed whenever indicated. 4. Daytime multiple sleep latency testing, if there is a complaint or suspicion of excessive daytime sleepiness or fatigue (methods discussed in CÜa£t§,Ll.l!.,,3,). Fig. 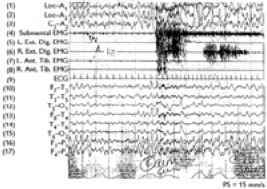 2 Polysomnogram of disordered rapid eye movement (REM) sleep in a man with REM sleep behaviour disorder who eventually developed Parkinson's disease. There is complete loss of 'REM-atonia', as the submental electromyogram (EMG) shows continuous muscle tone (channel 7). The appearance of a rapid eye movement (channels 1, 2) signals the onset of excessive muscle twitching in the upper/lower extremity EMGs (channels 8-15). The EEG (channels 3-6) shows the typical low-voltage fast-frequency desynchronized activity of REM sleep. ECG rate (channel 16) remains constant despite generalized muscle twitching, which is a common finding in REM sleep behaviour disorder. Electro-oculogram: channels 1, 2.